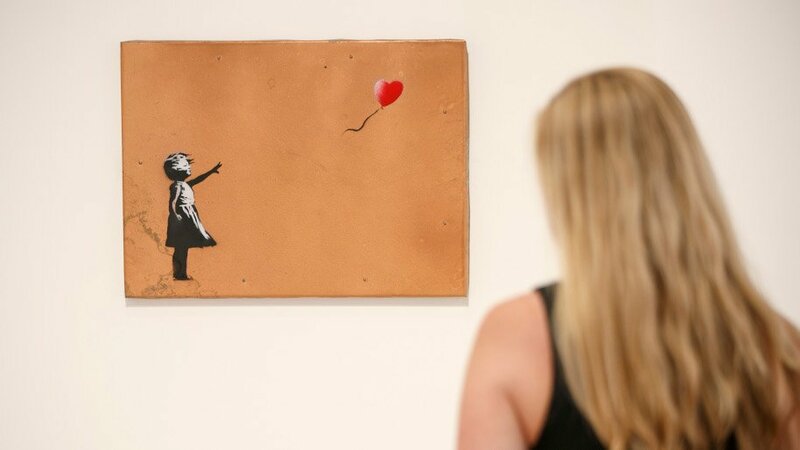 At this week’s Sotheby’s Auction House in London, world-renowned artist Banksy’s latest painting was for sale. Called “Girl with Balloon”, the painting drew interest from dozens of people who were ready to make a significant bid for it. Little did they know that within minutes the painting would be irreversibly damaged. Just as the half-hour auction ended at an incredible $1.4 million, half the piece was shredded right in front of the entire auction house. With half of the million dollar piece hanging out the bottom of its frame in tatters, the room was overwhelmed with silence and grimacing. The destruction of the piece was no mistake, though. Banksy had rigged the frame of the piece to destroy the painting after being sold using sharp blades to strip the prized painting into dozens of pieces. The audience had no idea it was intentional, and seeing one of the most costly items at the auction house get ruined was almost too much to bear. Banksy is known worldwide for his satirical works and dark humor, so it wasn’t long after the incident that people caught on to what had really happened. And it was only a few hours afterward that the madman himself posted a video detailing how he created the auto-shredder, as seen below. Funny enough, the painting is actually worth more now that it has caused a commotion on social media, with some estimating that it’s now worth at least $2.5 million.